Those are my church keys. One is the master key and it opens most of the doors here. One is just for the pantry. Sadly, we had to rekey it and carefully distribute the keys, as food and supplies kept going missing. (People never seem to steal our bibles…) One opens the server room and one the mechanical rooms. There is an Allen wrench to dog out the doors from the inside so they will open freely when they’re not locked. There is a key to the safe and a key to the cabinet for important papers. There is a security fob for online banking. There is my flashlight from the Sunday school at the Evangelical Church in Damascus, Syria, which always says to me that even when your light is small, you can still shine it out in love! 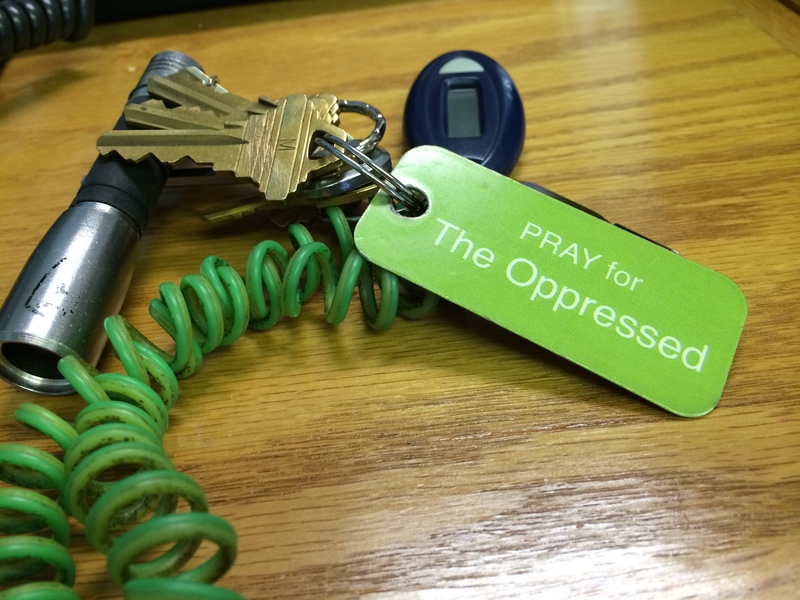 And then there is that daily reminder, the most important key of all…pray for the oppressed. It was a gift from a dear friend who opened the doors to me to the church in the Middle East. And if you didn’t already know it, they are suffering greatly these days, and they need our daily prayers. The town is Qaraqosh and it was one of the places Christians had fled to from Mosul, another ancient place in the history of my faith. The historical loss of artifacts is devastating. The loss of life is too much to bear. And so I pray for oppressed…and the oppressor. This prayer seems to put the words in my mouth and heart that I am just too grieved to come up with myself. Won’t you join me?